5. Geller objects to a private airline removing pork from its menu when traveling to/from a Middle Eastern country, even though many American Jews are familiar and comfortable with pork-free flights to the Middle East. 9. Geller promotes intolerance by using mocking terminology for religious figures, such as “Moe” for Muhammad, while Jews have rightly been upset at the use of mocking references to Jewish names and should be uniquely concerned with nomenclature given issues such as references to the Tanakh or the “Old” Testament. Appreciated JSB, Ramadan mubarak said to LWers. Umm, no. During Ramadan, Muslims fast from sun-up to sundown. On Yom Kippur, Jews fast from sundown to sundown! 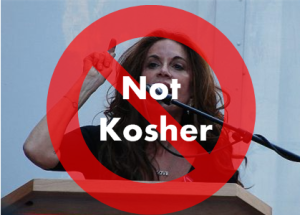 So, Pamela Geller is not just a bigot, but she doesn’t know the most basic/important Jewish practices. And, for all those celebrating tomorrow and for the next month: Ramadan Mubarak! That’s a great point. I didn’t think of it. Actually I rarely go to JihadWatch, AtlasShrugs, and the like sites. I don’t know why. But it could be a subconscious move to keep my blood pressure in check, thereby cutting down the chances of clogging my arteries or an outright stroke. Come to think of it, though, why couldn’t JihadWatch be StruggleWatch? Perhaps Robert would give it due thought. On Bush. I don’t think we will ever know what he had in mind when he used the term Crusade. But I have always given him the benefit of the doubt that he didn’t mean it in the sense of the historical Christian Crusades. On the other hand I am sure that at least some who unreservedly supported his Wars looked upon them as Crusades in roughly the same sense as the Crusades of long past. When the IRS agrees with Geller, it’s a great agency. When it disagrees, it’s a source of Obama-inspired persecution. I know that many polemicists have trouble being consistent, but I think they usually take more than one day to contradict themselves.